Warm thoughts for cold days. For my dear departed friend Art Marshall, W1FJI. I compiled his newsletter articles and crafted a suitable front page. 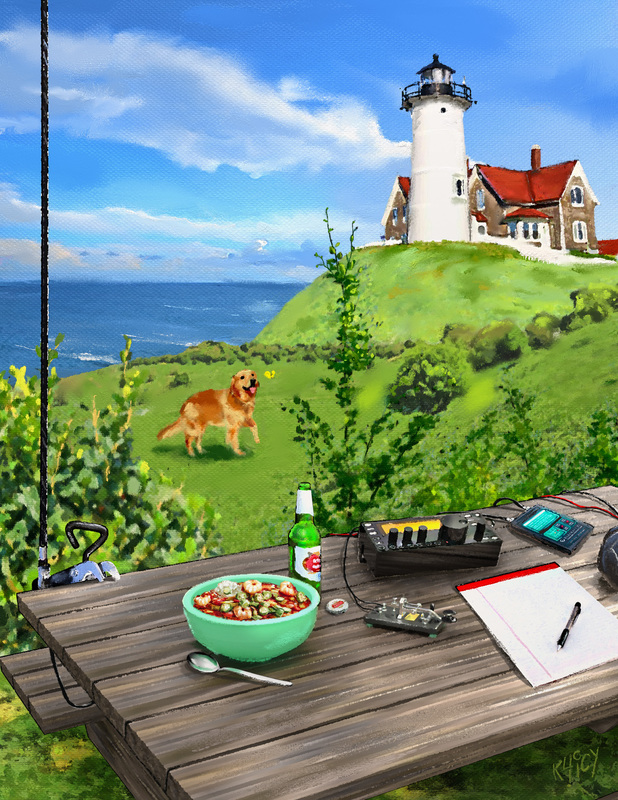 All included elements from the bowl of gumbo and beer to the specific lighthouse, radio and antenna were true components of his favorite pastime. I used a mix of MoI, Thea, Photoshop and finally Verve. Mikes Back! The forum is popping now! Anyway, you can probably already tell how much we've missed you already! I didn't even know how to start reacting to your fantastic tribute to your friend. It's heartfelt and really introduces us to him and how you feel for him. Without a doubt, he sees this, too. Beautiful piece and a brilliant comeback! I sincerely hope you'll be around more frequently again?! Work got busy and I had to finally give up the newsletter which took much of my personal art compulsion away. Plus, the deaths of two uncles and a friend, a mother with cancer, and a couple of house moves - and - I almost made an ill-considered marriage mistake (whew).. life stuff, long story.. I'm still not out of the woods, so to speak about my hobbies; love the 3D, love the radio and might even pick up beekeeping. Anyways, one of my daughters got a new simple Intuos I can use at home but I just ran into an install snag. I believe there are a bunch of new Verve features I am amiss on.. still don't understand the custom brush deal.. don't know why. Then again, I've been using PS since the early 90's and I'm still discovering its features. Taron, will you be posting demo vids in the future? What vivid, warm and living memories! Fare well Art Marshall, it seems like you have been in very good company during your stay on earth. Mike, hope you are OK? Loosing a friend is loosing a little part of oneself each time. Kids are always good to have them around seeing and feeling the circle of life. Would be lovely to see some more wonderful painted radios again. I have started something about imagebrush but not finished yet. Hope to find time for it soon. Now I am extra motivated. Well, sounds like you'd be craving some boredom, Mike. Even tragedies shape life and give you a chance to refine more and more of your own path. How often do we wish things were easier, while our real quest is to understand how to deal with all that, which seems so hard. The more we understand it, the more we can appreciate where we take ourselves to and at the end we will recognize all the blessings only to ever possibly regret what we did, not what was happening around us. It's part of our mission to work down the pile that might become our regrets, hehehe. Speaking of regrets, <caugh> , I'm still too ashamed of the GUI as it is right now. I will have to clean it up before I make a new video, but I really, really want to! So... yeah, there will be new videos! Such profound wisdom indeed. Thank you. I have taken notice to the leaps I grow as an artist during times of adversary in my life. ..so I take those as great consolation. It was an actual thought of mine last night around midnight under a bright half moon as a doe made her nightly traipse through the woods behind the house. Hmm, maybe I'll ask ole' St. Nick for a GTX 1080 Ti. One can dream. For your comeback only, I finished my tutorial about image brushes today.